One of the documents in Stuart Schulberg's files on the Nazi concentration camps. 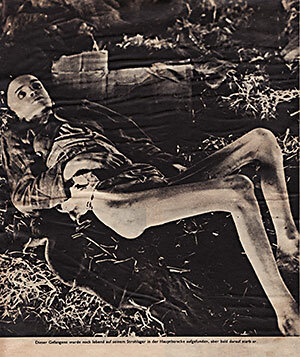 The German caption reads: This inmate was still alive when he was found on his bed of straw in the main barrack, but died shortly thereafter. Nuremberg: Its Lesson for Today derives power from its stark, black & white cinematography, the use it made of the Nazis’ own propaganda films, the testimony of such infamous figures as Hermann Goering, and from the devastating, heart-rending images of human cruelty. The Schulbergs’ OSS Field Photographic Branch/War Crimes Team prepared a 4-hour compilation of fully authenticated German material, which was screened in the courtroom on December 13, 1945, under the title, The Nazi Plan. It traced the Nazi rise to power, beginning in 1920s and continuing through the war. This evidentiary film was, towards the end, constructed hand-in-hand with the prosecutors, and became an important element of the prosecution’s case. They also compiled a 1-hour film called Nazi Concentration Camps. This was a specially edited version of Army Signal Corps Atrocity Film, filmed at camps that had been liberated by the Americans and British in May 1945, including Bergen-Belsen, Buchenwald, Dachau, Mauthausen, Nordhausen, Ohrdruf, and at Hadamar, where doctors performed hideous experiments on people. Other footage screened at the trial included a 60-second 8mm film of Jewish men and women being dragged (some of them naked) from their homes; and two films presented by Soviet prosecutor Roman Rudenko, German Fascist Atrocities in the USSR, and The Destruction of Lidice. During the editing period in Berlin, Stuart Schulberg located a historic piece of film in the Berlin apartment of a Nazi SS officer named Nebe, showing the experimental gassing of human beings in a small outbuilding on the outskirts of Mogilev, Poland. Schulberg chose to include that footage in the film, even though it had not been shown at the trial.